Anger is an emotion that can have devastating effects to your health, your relationships, your career, and virtually every other aspect of your life! It can range from mild irritation all the way up to intense rage – and everything in between. Anger is one of the most common, yet at the same time most difficult, emotions we experience. In this “audiotherapy” program Dr. Broder will teach you all about your angry reactions; first to identify to whatever triggers your anger, then to defuse those triggers, and finally to bring your angry reactions firmly under your own control in a lasting way. In addition, you will learn clinically-proven strategies and tools for controlling your angry reactions, whenever they are triggered. This powerful and highly acclaimed “audiotherapy” self help program is used by people around the world to help to them manage and overcome their anger. 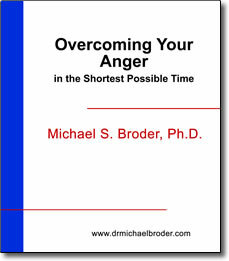 Overcoming Your Anger in the Shortest Time Possible is also used, recommended and highly endorsed by therapists, life coaches physicians and other professionals everywhere to help their clients/patients learn anger management and how to control their temper when temper is a problem. The anger self-help audio program contains numerous proven strategies for controlling anger on the spot as well as for examining and changing the attitudes that underlie anger so that it does not resurface.